Building your idea into a product requires a process that involves several different modes of expertise and knowledge. Above all, one must have a plan or methodology to follow so that the outcome will meet one’s expectations and more importantly your plan will address what your proposed target audience needs. First and foremost to your plan is the need to focus your idea. This is done by doing comprehensive research and identifying potential competitors, in order to understand what the proposed value of your offering is in comparison to other players within your niche market. Often it may be more difficult to be first player in your market than being in a position among several other players. Despite the fact that being first gives you the advantage, it also means your market is not yet defined and you need to educate your customers in advance on how to use your product. Researching also involves identifying your target audience or Personas – this is very important and allows you to understand the demographic of who you are aiming your offering at in order to understand what specific requirements the given target audience might have. There also may be more than one Persona for your product, which might mean that you need to define different requirements for each type of user. Be careful not to skip this step, because it may result in an unfocused offering that will not appeal to a real audience (only an abstract one). The research should evolve into a list of detailed requirements, which are then prioritized by importance. Prioritizing each and every stage of the process is an important step in being able to define your minimal viable product. Having too many requirements and stages all at once may also mean that you will not be able to meet your timetable target date and budget goals. By following the Lean Start-up approach, you will want to launch your product within the basic requirements that meet your target audiences’ needs. Then, by receiving feedback from your audience, you can start to improve your offering. This is a common mistake made by many startups – by not being able to define the minimum viable product, one instead tries to launch their product with as many features as possible – thereby potentially cluttering your offering to your audience with unnecessary ‘bells and whistles,’ which only consume everyone’s development time and your money. The process described above, which includes the research and building the initial prototype of your products (without development), can take around 2-3 months, depending on the complexity of your product and your ability to find the right people to help you in this process. These steps will help to ensure that the product you actually put your investment into is the right offering for the right audience. Preparing a product’s functional design is important, for it enables you to visualize how the product will look. Having a functional design also allows you to show potential users and map their reactions. Although this happens at a preliminary stage of the product’s process, such early testing will help you to receive valuable feedback that you can use to improve your product sometimes even before the development begins. 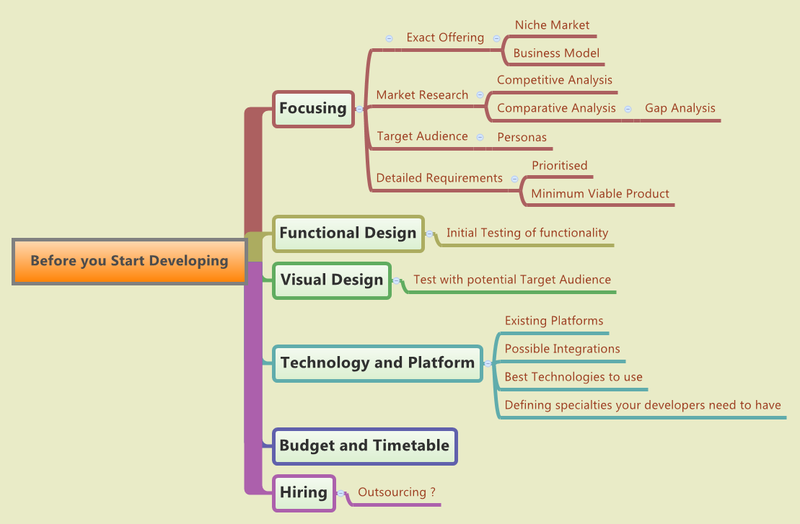 You should have in your team a good UEX designer who will help you draw the initial functional designs of your product. Then you can involve a visual (graphic) designer to transform this into a tangible design which will be later used by the developers. The functional design is also useful as a tool to explain to developers what your requirements are in each and every part of the application. Prior to actual development, you should by now have a very good understanding of what the best technology to use to develop your product. This might include using either an existing platform – thereby integrating your product with existing open source1 solutions – which can save you valuable time and money, or developing a platform from scratch. Understanding this choice of technology will also help you define what skills your developers will need to have in order to be able to build the product. The hiring process can run concurrently with the research process as you come to understand what your technology needs are, and what type of specialties your developers need to have. These questions and issues can all be directed to your CTO for him to answer, (which may be in a consulting or freelance capacity to start with) because he is the one who will focus on your technological needs and help you in the hiring process of your developers. 1Open Source In production and development, open source as a development model promotes universal access via a free license to a product's design or blueprint, and universal redistribution of that design or blueprint, including subsequent improvements to it by anyone.